Tiramisu Bowl: Serve it Your Way! "Vanilla, chocolate, coffee, and fresh raspberries combined in three separate ways--you choose! Prepare this tiramisu in a bowl, pan, or individual parfaits." Beat cream cheese in large bowl with mixer until creamy. Gradually beat in milk and dry pudding mixes. Gently stir in 2 cups COOL WHIP. BOWL: Line bottom and side of 2-1/2-qt. bowl with half the wafers; drizzle with half the coffee. Top with half the pudding mixture and chocolate. Repeat layers. Top with remaining COOL WHIP and raspberries. Refrigerate several hours. PAN: Line bottom of 13x9-inch pan with half the wafers; drizzle with half the coffee. Top with half the pudding mixture and chocolate. Repeat layers. Top with remaining COOL WHIP and raspberries. Refrigerate several hours. 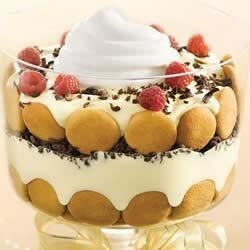 PARFAITS: Place 1 wafer on bottom of each of 16 dessert dishes; drizzle each with 3/4 tsp. coffee. Top each with 1/4 cup pudding mixture and a sprinkle of chocolate. Repeat layers. Top with remaining COOL WHIP, raspberries and wafers. Refrigerate several hours. Create a delicious, authentic tiramisu--rich and impressive.